You know about the airing of grievances, right? That thing they did on Seinfeld during Festivus where they sat around and loudly proclaimed all the things that bothered them. Sort of the opposite of Thanksgiving and meant to be humor and part of a show that was legitimately proud of being about…nothing. Anyway. Here’s the thing – I’m all about authenticity. It’s a passion of mine to encourage women to be confident in who they are in Christ, with all their passions, strengths, flaw, broken parts, and imperfections. I love when I see women stop pretending to be someone else and instead settle into the deep, comfortable rhythm of living life as themselves and not the edited version they want people to see online. I can’t tell you enough how much I want more “un-fine” in my life, how I want you to feel like you can have a bad day around me, and be okay when I’m not perfect either. I believe there is grace for all of those days – the beautiful and the broken and all the daily life in between. But there is a distinct difference between being authentic online and airing your grievances and dirty laundry constantly. And I don’t want you to come here thinking I’m encouraging you to go off and share every little piece of your vulnerable heart online. I don’t. I don’t want that in real life for you and I don’t think it’s healthy at all online. But I’ve noticed this trend over the years, as I’ve become more involved in social media – it’s becoming acceptable to process and over share and be too open with too many people online because there is safety in sharing behind the screen. And the reason I notice it? I’m the first to confess that I’ve done it. I’ve use my platform as a place to grumble, complain, process and I’ve been convicted to go on my knees before God to ask forgiveness for it. I believe strongly that social media can be used to glorify God. I also believe that in order to surround myself with the kind of women I want to be around online, I need to model that same behavior. Bottom line? It’s ok to feel upset. Feelings are fine. But you don’t have to post about it. If you feel envious of someone else, take that heart issue up with God, don’t share on Twitter. If you try to join something and it doesn’t meet your expectations, re-evaluate your expectations. Our “what’s in it for me” culture has made it acceptable to be disgruntled when we don’t feel like we got the biggest bang for our buck. Instead of reacting harshly (and forgetting there are hard working people – real people – behind the experiences you’re signing up for) think about how you could volunteer/promote/host/change to make it better next time. If you disagree with what someone says/does, pray about how God would have you address it before you comment publicly. If writing is how you process, great. But processing doesn’t mean publishing and private thoughts are perfectly fine. Our goal online as sisters in Christ should never be to put someone else down to life ourselves up. Let’s live authentically as true sisters in Christ – loving one another the way Christ loved us and remembering that on the other side of the screen? On the other side of the tiny avatar, 140 characters and beautifully Instagramed photo is a real person, with real feelings, living a real life that we can’t possibly know all about. 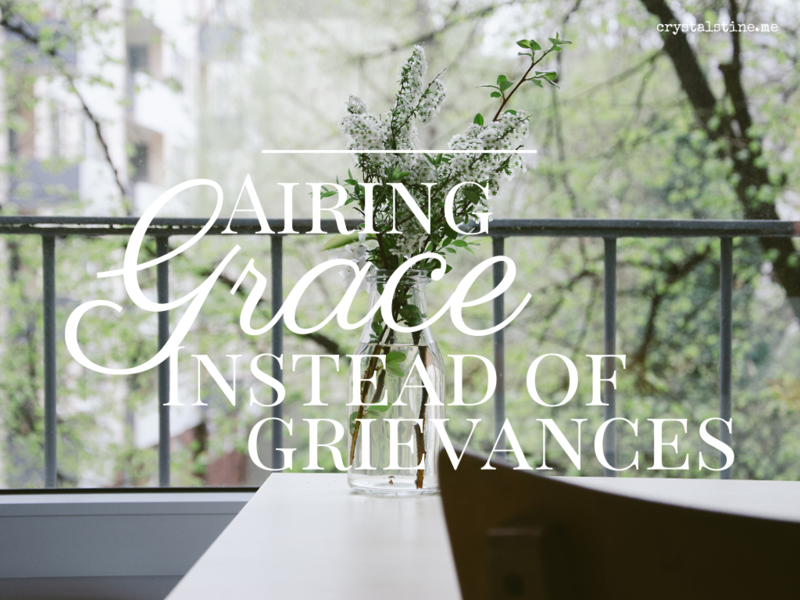 So let’s choose to air grace instead of grievances and turn the internet into a place of encouragement. I’ve been scrolling through your past posts this afternoon, and this one really struck me. I try not to be complain-y or whiney online, but I do think that sometimes I overshare because I SO want to connect with people in the online space. As someone who totally processes through writing, I think it’s probably a good thing that my post ideas are usually scheduled at least a month in advance, and the posts themselves are written at least a week ahead of time. That extra margin gives me the clarity to weed through what doesn’t actually belong out on the public. Social media and commenting on blogs, on the other hand, is much harder to keep track of. Thanks for posting such a necessary reminder! This post really struck a chord with me. I realized that while I try to keep an intentional hat on when I’m blogging and tweeting (not saying that it actually happens, just that I make an effort! ), I fall down all over the place when it comes to say, my personal Facebook page. Then my well-honed snark and sarcasm leaks terribly all over the place and let’s face it – that’s not much of a consistent, transparent life now is it? You’ve really encouraged me to re-evaluate my *entire* online presence to be more consistent with what I’m praying that my *entire* life will portray. Thank you so much Crystal – this was the good stuff! Very real post, Crystal. I am waving my pom-pons (that’s what they’re called, right?) yet feeling slightly convicted all at the same time. I try to be so careful of what I share and to be mindful of complaints, but sometimes I know they slip through… Thank you for the reminder that we should ALWAYS take it to God and that, even if we need to write it to process it – that doesn’t mean it should be public. 😉 Awesome post! I think you are right. It’s easy to share because we want validation for our feelings, and sometimes there may be a place for sharing. More often than not though, when we want to share too much and use our outlets to complain, disagree, etc, it is probably a sign that something is off within our spirit. Something that we need God to fill, not comments and “likes”. life that we can’t possibly know all about.” Such a beautiful reminder, Crystal! I appreciate how you lovingly challenged each of us to re-evaluate our social media interaction. Appreciate your heart in this & your boldness to speak truth! HUGS! We will hold each other accountable, yeah? Because the Lord knows I need it more than anyone (it can be a battle to keep the words from leaving my fingertips some days). I think this should be required reading before anyone can join social media. I am learning to use my online presence more intentional. I want use it to connect with others in a real way but there are still those things that I know needs to be kept off-line. I agree! I’m a very private person. Even when I joined the online world I kept a lot private. I’ve learned to air graciously. I’ve also learned to be more authentic and naked in my writing being transparent and not going overboard. I’m like you, Crystal. I am nervous about what I release online. I’m in agreement with what you say here. Thank you for allowing God to use you, Crystal. I simply love it. It’s hard to see that line between “sharing our messes” and “airing grievances”. But your point that whatever we say, there are people behind the scenes-so true! Great post, and a great reminder to evaluate what I’m writing each time I hit the publish, tweet, or post buttons! Oh girl!!! You knew I’d be the first person here right?? So much truth and wisdom here and a few little pokes in my own spirit – often grumbling is the first place I go and God has been prodding me in the last several months to use my online life as a means of encouraging and receiving encouragement – not posting or tweeting whatever might give me the biggest reaction. You’re a world changer friend… and these words? These words? AWESOME! Cheering you on!! !